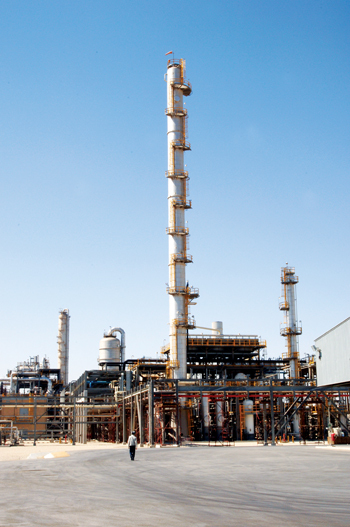 SIPCHEM announced the start-up of the ethylene vinyl acetate (EVA) and low density polyethylene plant owned by International Polymers Company (one of Sipchem affiliates) in Jubail Industrial City. The plant will produce 200,000 tonnes per year of EVA and low-density polyethylene (LDPE). He added that the EVA plant is considered the first of its kind in the Middle East and its polymer products constitute a very important raw material for a variety of downstream and advanced industries. Sipchem’s strategy is to increase added value to its products by integrating downstream projects with current existing products in order to meet domestic and international market demands. Total cost of the project is about SR3 billion ($799 million). Sipchem owns 75 per cent of International Polymers Company while Hanwha Chemical Korean Company owns 25 per cent. EVA is used as feedstock to produce heat soluble adhesive resin products and high-quality sports bandages. LDPE is used as a feedstock in the production of various types of containers, bottles and medical detergents. Established in 1999, Sipchem manufactures and markets methanol, butanediol, tetrahydrofuran, acetic acid, acetic anhydride and vinyl acetate monomer as well as carbon monoxide through its various affiliates. It has been listed on the Saudi Stock Market since 2006. It serves customers in the construction, solvents, automotive, electronics, polymer, coatings, and pharmaceutical industries.